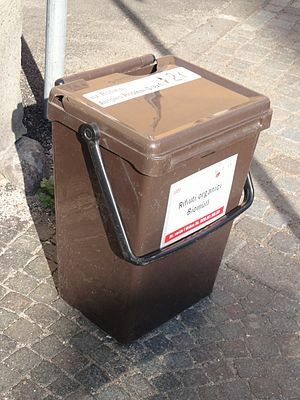 … you get excited about the arrival of your new Biomüll bin! Look, it has a lid and everything (to hopefully keep the flies out). Of all the things about life in Germany, that annoy, amuse or simply puzzle me, the one thing I hate the most and don’t think I’ll ever get over is dealing with the Biomüll. This is actually supposed to be Jan’s job – along with washing the dishes, although I am actually more forgiving on the latter and usually end up doing them myself. Most of the time, Jan actually does take down the Biomüll – if only because I nag remind him constantly until he does – I really, really hate the Biomüll! However, this time Jan had let it build up for several weeks (despite my comments!) and still didn’t take it down despite having an entire day off on Thursday. Supposedly to pack, but he didn’t do that either until 10 o’clock at night! Since he is now away for a week, and the stuff in there was getting to the stage where it no longer looked like food and I was beginning to fear it might actually come to life and take over the kitchen, I had no choice but to take the evilness down. So I grabbed the little bin, taking care to hold the handle with as few fingers as possible, and headed down two flights of stairs to the courtyard out the back. Once there, I opened the Biomüll container – causing a cloud of flies to swarm into my face – and emptied our food stuffs onto the remains of everyone else’s that was already in there.